Flu season is here: When to take your child to the doctor, and when to stay home. Taking a sick kid to the pediatrician’s office can sometimes do more harm than good. In a waiting room, your child might just be waiting to get even sicker. A few weeks ago, I took my 3-month-old to the pediatrician because she wasn’t eating. When I walked in, the receptionist warned me: “Oh, we’ve got a ton of sick kids in here right now.” Awesome, I thought. Commence obsessive hand sanitizing. But of course, we were in a doctor’s office in the middle of October—what did I expect? Ninety minutes later, the pediatrician on duty sent us to the emergency room at a nearby children’s hospital so my daughter could get intravenous fluids. He was worried she was getting dehydrated. After spending an hour in the waiting area across from a boy sick enough to be wearing a surgical mask and two more hours sitting on a bed in the hospital hallway surrounded by more miserable kids, we eventually got a private room, and at 4 a.m. my daughter finally got her IV—approximately half an hour after she had already perked up and started eating again. The nurses apologized: It was especially crowded that week because there were so many nasty viruses going around. Viruses, I thought, that my daughter and I have just been exposed to for five hours. Sweet. When your kid is sick and you’re worried, you should take him to the doctor. And with this autumn’s smorgasbord of infectious diseases, parents are undoubtedly worried a lot. There was the 4-year-old in New Jersey who went to bed seemingly healthy and died in his sleep from enterovirus D68; the now 70 children who have developed mysterious polio-like symptoms, perhaps from the same enterovirus, but no one really knows; and then, you know, Ebola. It’s no surprise that many pediatrician’s offices and children’s hospitals have been more crowded this fall than usual. But while your instinct as a parent might be to take your kid to the doctor at the first sign of illness, there are times when staying home is actually safer. Let’s take enterovirus first. Although this particular strain has been around since the 1960s (and enteroviruses in general are very common), EV-D68 has been particularly ferocious this year. And in a small subset of kids—two-thirds of whom either have asthma or other pre-existing lung conditions—this infection causes serious respiratory symptoms that typically require ICU care. So if your child has had a regular old cold for a few days, you probably don’t need to worry or take him to the doctor. But if your kid suddenly has trouble breathing, take him to the pediatrician or emergency room ASAP. Troubled breathing can manifest itself as breathlessness or rapid breathing; you may notice your child’s chest wall moving abnormally or see her ribs digging in with each breath. Babies may have trouble breast-feeding or keeping bottles in their mouths. As for the bizarre neurological symptoms that may or may not be related to EV-D68: These are terribly scary, but extremely rare. Here, what you want to look out for is sudden limb weakness. If an older child complains that his leg suddenly feels very weak, for instance, or if your 3-year-old suddenly stops using his right arm, you should probably take him to the doctor. Even if your kid does have a true fever, you can, in many instances, stay home. Fevers generally cause harm to the body only if they are at or above 105.8 for a long period of time. And most are caused by viruses, so “there’s nothing that we’re going to be able to do about them,” Benaroch says. Since most viruses last two to three days, a safe rule of thumb is to take kids to the doctor if a fever lasts longer than three days—that’s a sign that something else is going on. And babies under the age of 3 months with fevers should always be taken to the doctor or ER immediately, as the fever could be a sign of a serious bacterial infection. 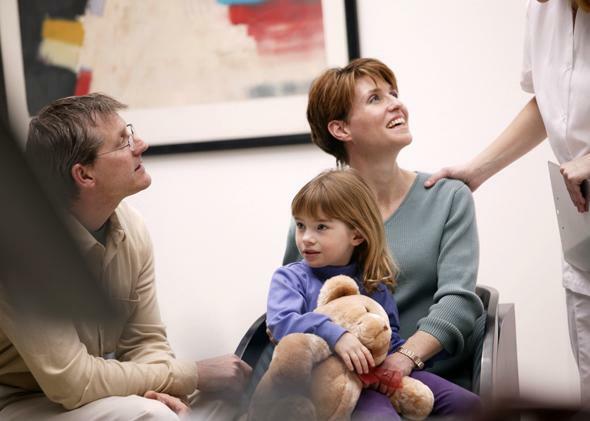 As anyone who’s ever spent 10 minutes in a pediatric waiting room knows, coughs are another popular reason for doctor visits. But most of the time, they’re caused by viruses too, and there’s not much to do but wait them out. Some exceptions: If your child has a cough associated with a barking or “whooping” sound or a high fever, or a cough that causes him to turn blue, breathe quickly, or have difficulty breathing, take him to the doctor right away. Coughs in young babies are also worth checking out. So if you have a kid’s well-child visit scheduled during the peak of flu season, should you reschedule it? It depends. The timing of these visits is pretty important for kids under 3, who are often getting immunizations and screenings. So go when the visit is due, but schedule your appointment first thing in the morning or right after lunch, when wait times are shortest. And avoid Mondays, which are often busiest in urgent care clinics and pediatrician’s offices. But “if your child is 3 or older, it probably won’t make that much of a difference to wait a month or two,” says Michael Cabana, chief of the Pediatrics Department at the University of California–San Francisco. There are other reasons to avoid the doctor’s office: A physician might give your kid a test or treatment he may not need. When my daughter stopped eating a few weeks ago, the pediatrician said he thought the ER doctors should give her a shot of antibiotics, just in case—even though she didn’t have a fever or any other signs of infection. The ER doctors did not agree, and indeed, she got better on her own. Giving antibiotics “just in case” happens a lot and it isn’t usually a good idea. As I’ve written before, this happens frequently with ear infections: Although the American Academy of Pediatrics advises doctors not to prescribe antibiotics for non-severe ear infections in kids over 2, a survey found that 85 percent of doctors prescribe them in these situations anyway. The same is true for the common cold. Although antibiotics do absolutely nothing to treat cold symptoms, in 10 percent of doctor visits for kids’ colds, physicians prescribe antibiotics for the children anyway. “Physicians often feel pressured to do something, to generate some ‘value added’ of sorts, for the time, trouble, and cost of seeing them, and antibiotics are a quick and easy way of doing that,” says David Newman, an emergency medicine physician at the Mount Sinai Hospital in New York City and the author of Hippocrates’ Shadow. Is it possible to take your kid to the pediatrician and yet not get overtreated? Of course. First, don’t ask too much of the doctor. Remember that many illnesses—particularly viral infections, which are oh so common in the fall and winter months—simply don’t have magic cures; sometimes your kid just has to suffer through. If your doctor does suggest a treatment, ask whether its benefits will outweigh its risks and ask whether less invasive options are also available (for instance, watchful waiting for an ear infection). If your doctor recommends a diagnostic test for your child, again, ask about the risks and whether its benefits will outweigh them. Also ask how the diagnosis will make a difference. “I think it’s important for parents to ask not just what the test will show, but to ask why making that diagnosis will help your child,” Schroeder says. If your doctor’s answer is “because then you will know,” he says, that may be a warning sign that your kid doesn’t really need it.